500 x High Quality Suited Numbered 12g Poker Chips (20 rolls of 25). 1 x Aluminium 500 Poker Chip Case. 2 x Poker sized, 2 corner, large index, 100% plastic playing cards. 5 x Red translucent dice. 1 x 50mm double sided White Dealer button. 1 x 50mm double sided Yellow Big Blind Button. 1 x 50mm double sided Blue Small Blind Button. 2 x PVC cut cards. Can i make my own selection of chips in this set? YES - If you require specific amounts of the colours available in this range, please use the Green 'Customise Item' tab above to make your selection. Poker Chip Set Length: 575mm. 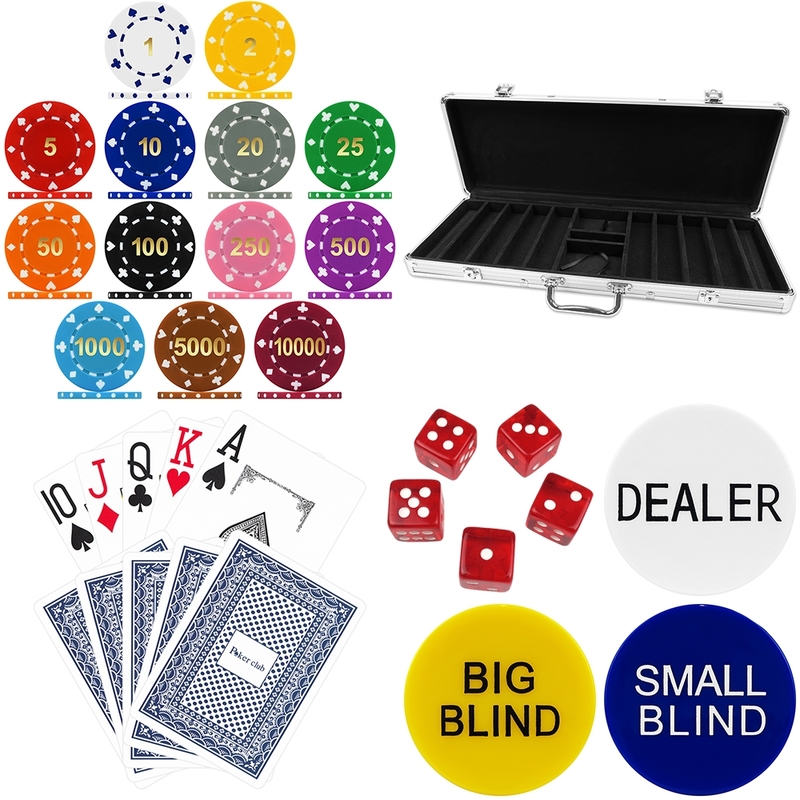 Poker Chip Set Width: 225mm. Poker Chip Set Height: 75mm. Poker Chip Set Weight: 7.50kg. This High Quality 500 Piece, Suited Numbered 12g Poker Chip Set is a new addition to our range and exclusive to Premier Poker Chips. The Suited Numbered Poker Chips are a classic 2 colour construction made from high grade ABS composite material. Each chip comes with a Shiny Gold Foil printed number on both sides and features a pair of Hearts, Clubs, Diamonds and Spade suited design and edge spots. Please Note: Colour shade may vary depending on your viewing screen. Standard set colours may vary depending on stock availability. Case style may differ from image shown.